has “cleared the neighborhood” around its orbit. These criteria are not applicable outside the Solar System. The moons in the top 10 largest non-planets in our solar system list below violate the 1st criteria, and the others (dwarf planets) violate the 3rd. Other than eight planets, all objects in our Solar System, no matter how large or massive, fails on the 1st or the 3rd criteria. The moons of the Solar System. If some of these moons were situated in different locations (orbiting the Sun instead of another planet), astronomers would define them as planets. Seven of the top ten largest non-planets in the Solar System are all moons. A non-satellite body fulfilling only the first criterion is termed a “small Solar System body” (SSSB). If an object fulfills the first two criteria but fails in the 3rd one, it is called a “dwarf planet”. This high-resolution color composite of Titania was made from Voyager 2 images taken January 24, 1986, as the spacecraft neared its closest approach to Uranus. Voyager’s narrow-angle camera acquired this image of Titania, one of the large moons of Uranus, through the violet and clear filters. The spacecraft was about 500,000 kilometers (300,000 miles) away; the picture shows details about 9 km (6 mi) in size. In addition to many scars due to impacts, Titania displays evidence of other geologic activity at some point in its history. The large, trenchlike feature near the terminator (day-night boundary) at middle right suggests at least one episode of tectonic activity. Another, basinlike structure near the upper right is evidence of an ancient period of heavy impact activity. The neutral gray color of Titania is characteristic of the Uranian satellites as a whole. 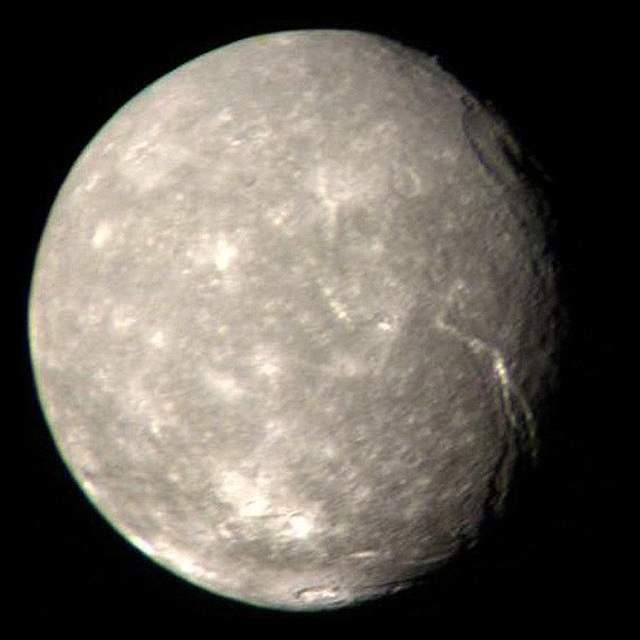 The 10th largest non-planet in our solar system, Titania is the biggest of the moons of Uranus. It is also the 8th largest moon in the Solar System. Titania was discovered by the German-born British astronomer William Herschel (1738-1822) in 1787, and named after the queen of the fairies in William Shakespeare’s famous comedy “A Midsummer Night’s Dream”. The Uranian system has been studied up close only once, by NASA’s Voyager 2 spacecraft in January 1986. During its Uranus flyby, Voyager 2 took several images of Titania, which allowed mapping of about 40% of the moon’s surface. Titania consists of approximately equal amounts of ice and rock and is probably differentiated into a rocky core and an icy mantle. A layer of liquid water may be present at the core-mantle boundary. Titania is covered with numerous impact craters reaching up to 326 km (203 mi) in diameter. Despite that, it is less heavily cratered than Oberon, outermost of the five large moons of Uranus. This is an image of the dwarf planet Eris (center) and its satellite Dysnomia (at 9 o’clock position) taken with NASA/ESA’s Hubble Space Telescope on Aug. 30, 2006. Hubble observations were obtained on December 3, 2005, and August 30, 2006, using the Advanced Camera for Surveys. The Hubble images were combined with images from the Keck telescopes taken on Aug. 20, 21, 30, and 31 to measure the satellite’s orbit and calculate a mass for Eris, the most massive and second-largest (by volume) dwarf planet (and plutoid) in the known Solar System. This is a cropped image. You can see the full-size image on NASA.gov. Named after the Greek goddess of strife and discord, Eris is the most massive and second-largest (by volume) dwarf planet (and plutoid) in the known Solar System. Its discovery in January 2005 by a Palomar Observatory-based team led by California Institute of Technology’s (Caltech) Mike Brown is the reason why Pluto is no longer a planet. Eris was originally thought to be bigger than Pluto. Because of that, NASA initially described it as the Solar System’s tenth planet. This, along with the prospect of other objects of similar size being discovered in the future, motivated the International Astronomical Union (IAU) to define the term planet for the first time. Under the IAU definition (see above) approved on August 24, 2006, Eris is a “dwarf planet”, along with objects such as Pluto, Ceres, Haumea, and Makemake, thereby reducing the number of known planets in the Solar System to eight. 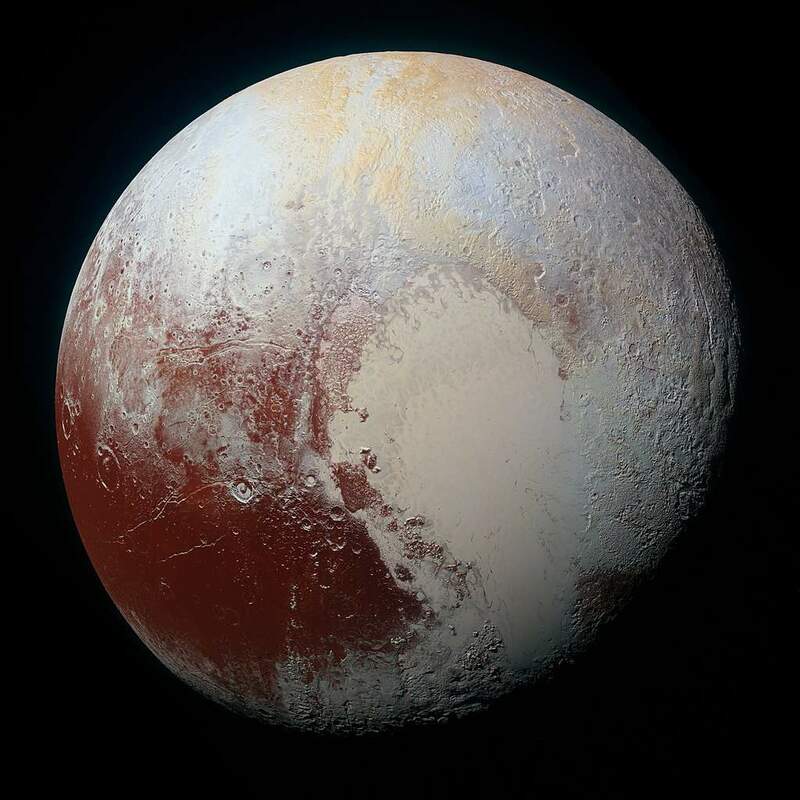 Today, we know that the Pluto is slightly larger by volume – but Eris has about 27% more mass than Pluto. Eris is also the largest body in the Solar System which has not yet been visited by a spacecraft. It was calculated that a flyby mission to Eris could take 24.66 years using a Jupiter gravity assist, based on launch dates of April 3, 2032, or April 7, 2044. Eris would be 92.03 or 90.19 AU from the Sun when the spacecraft arrives. NASA’s New Horizons spacecraft measured Eris’ diameter as 2,372 ± 4 km (1,473.9 ± 2.5 mi) in July 2015. Eris has a moon, named Dysomnia. It has an estimated diameter of 700 ± 115 km (435 ± 71 mi). Once considered to be the ninth planet, Pluto is the 8th largest non-planet and the largest and second-most-massive (after Eris) known dwarf planet in our Solar System. 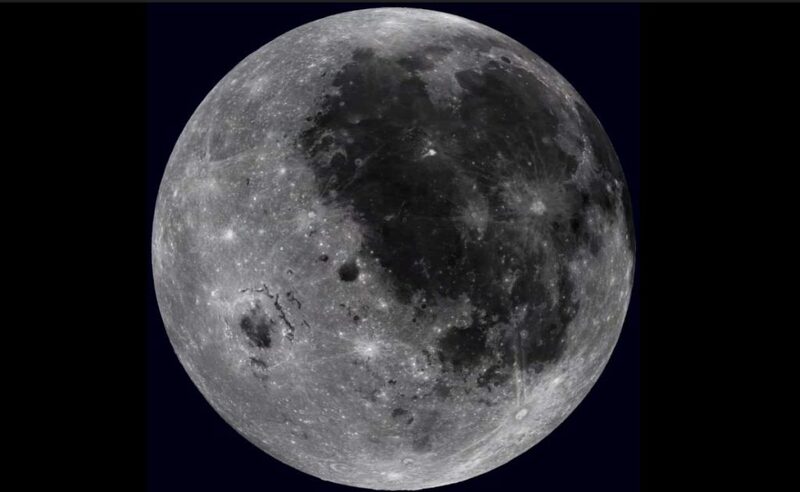 It has a diameter of 2376.6±3.2 km (1,476.8 ± 2 mi) and its mass is (1.303±0.003)×1022 kg, 17.7% that of the Moon (0.22% that of Earth). Its surface area is 1.779×107 km2 or roughly the same surface area as Russia. Its surface gravity is 0.063 g (compared to 1 g for Earth). With less than 0.2 lunar masses, Pluto is much less massive than the terrestrial planets (Mercury, Venus, Earth, and Mas), and also less massive than seven moons: Ganymede, Titan, Callisto, Io, the Moon, Europa, and Triton. The mass is much less than thought before its moon Charon was discovered. The center of mass (barycenter) of the Pluto-Charon system lies outside either body. Because neither object truly orbits the other, and Charon has 12.2% the mass of Pluto, it has been argued that Charon should be considered to be part of a binary system with Pluto. The International Astronomical Union (IAU) states that Charon is considered to be just a satellite of Pluto, but the idea that Charon might be classified a dwarf planet in its own right may be considered at a later date. 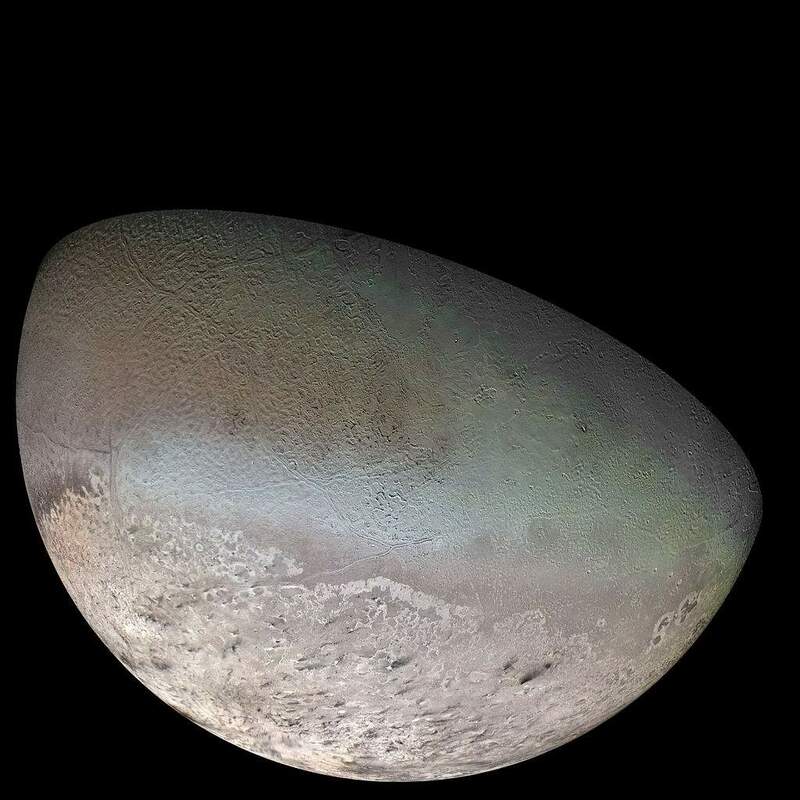 Triton is the largest natural satellite of Neptune. First observed on October 10, 1846, by the English astronomer William Lassell (18 June 1799 – 5 October 1880), it is also the first Neptunian moon to be discovered. Triton was once the Solar System’s largest Kuiper belt object but was gravitationally captured by Neptune (because of its retrograde orbit and composition similar to Pluto’s, Triton is thought to have been a dwarf planet captured from the Kuiper belt.). It is the only large moon in the Solar System with a retrograde orbit (an orbit in the direction opposite to its planet’s rotation). It is also the second-largest planetary moon in relation to its primary after Earth’s Moon. 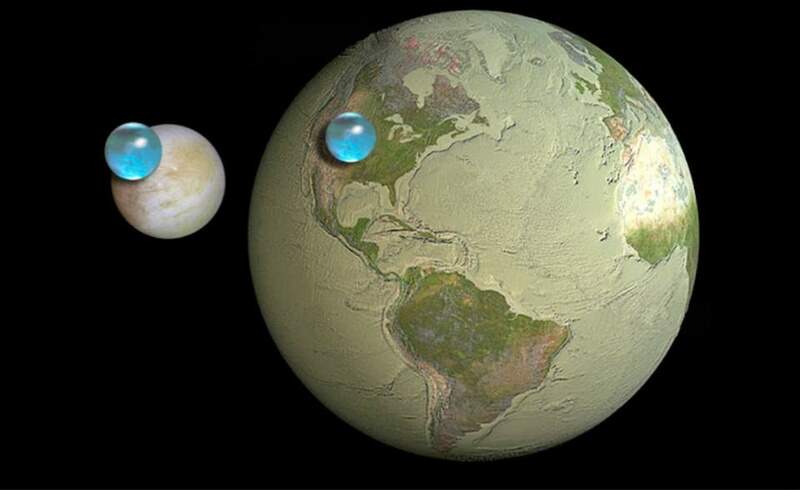 All of the water on Jupiter’s moon Europa compared to all of the water on Earth. Scientists’ consensus is that a layer of liquid water exists beneath Europa’s surface. It is estimated that the outer crust of solid ice is approximately 10–30 kilometers (6–19 mi) thick, including a ductile “warm ice” layer, which could mean that the liquid ocean underneath may be about 100 kilometers (62 mi) deep. This leads to a volume of Europa’s oceans of 3 × 1018 m3, between two or three times the volume of Earth’s oceans. Europa is the smallest of the four Galilean moons Notes 1 orbiting Jupiter. It has a smooth and bright surface, with a layer of water surrounding the mantle of the planet, thought to be 100 kilometers (62 miles) thick. Its smooth surface includes a layer of ice, while the bottom of the ice is theorized to be liquid water. The apparent youth and smoothness of the surface have led to the hypothesis that a water ocean exists beneath it, which could conceivably serve as an abode for extraterrestrial life. Heat energy from tidal flexing ensures that the ocean remains liquid and drives geological activity. Life may exist in Europa’s under-ice ocean, perhaps subsisting in an environment similar to Earth’s deep-ocean hydrothermal vents or Antarctica’s Lake Vostok. Life in such an ocean could possibly be similar to microbial life on Earth in the deep ocean. Earth’s moon is the only satellite of a rocky world on this list. it first formed after Earth is hit by a planet sized body around 4.5 billion years ago – roughly 50 million years after the Earth itself formed. Like all other moons on this list, our Moon is tidally locked to its parent planet, with the same side always facing the Earth. Io is the innermost of the four Galilean moons of Jupiter. It is the fourth-largest non-planet, has the highest density of all the moons, and has the least amount of water of any known astronomical object in the Solar System. With over 400 active volcanoes, some erupting lava fountains dozens of kilometers high, Io is also the most geologically active object in the Solar System. Its volcanoes are at times so powerful that they are seen with large telescopes on Earth. 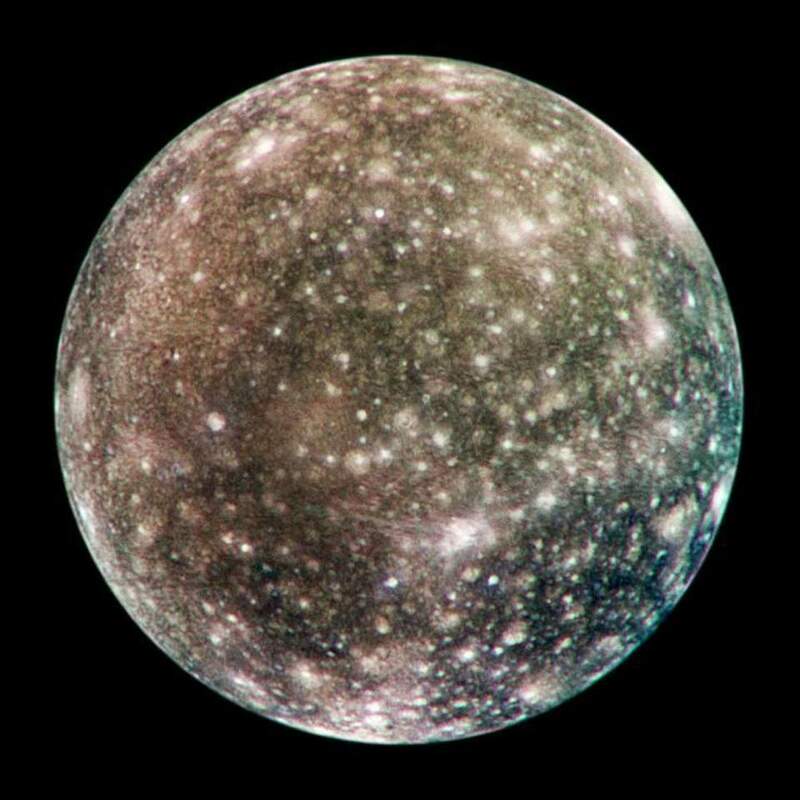 Discovered in 1610 by Galileo Galilei, Callisto is the second-biggest moon of Jupiter and the third largest non-planet in the Solar System. It has about 99% the diameter of the smallest planet, Mercury, but only about a third of its mass. Its surface is the most heavily cratered of any object in our Solar System. Once thought to be a dead, inactive rocky body, data gathered by the Galileo spacecraft in the 1990s indicate Callisto may have a salty ocean beneath its icy surface. More recent research reveals that this ocean may be located deeper beneath the surface than previously thought, or may not exist at all. If an ocean is present, it’s possible the ocean is interacting with the rock on Callisto, creating a potential habitat for life. However, conditions are thought to be less favorable than on nearby Europa. Saturn’s fourth-largest moon, Dione (698 miles or 1,123 kilometers across), can be seen through the haze of the planet’s largest moon, Titan (3,200 miles or 5,150 kilometers across), in this view of the two posing before the planet and its rings. Titan is the only moon known to have a dense atmosphere, and the only object in space other than Earth where clear evidence of stable bodies of surface liquid has been found. Many of the gases that make up Titan’s brown haze were hydrocarbons, theoretically formed via the recombination of radicals created by the Sun’s ultraviolet photolysis of methane. Titan is primarily composed of water ice and rocky material. Its climate, including wind and rain, creates surface features similar to those of Earth, such as dunes, rivers, lakes, seas (probably of liquid methane and ethane), and deltas, and is dominated by seasonal weather patterns as on Earth. With its liquids (both surface and subsurface) and robust nitrogen atmosphere, Titan’s methane cycle is analogous to Earth’s water cycle, at the much lower temperature of about 94 K (−179.2 °C). In the photo, north is up on the moons. This view looks toward the northern, sunlit side of the rings from just above the ring plane. Images taken using red, green and blue spectral filters were combined to create this natural color view. The images were obtained with the Cassini spacecraft narrow-angle camera on May 21, 2011, at a distance of approximately 1.4 million miles (2.3 million kilometers) from Titan and 2 million miles (3.2 million kilometers) from Dione. Saturn’s largest moon Titan is one of the two moons which bigger than a planet (Mercury), but only 40% as massive. It is the only moon in the solar system known to have a dense atmosphere, and so far, the only object in space, other than Earth, where clear evidence of stable bodies of surface liquid has been found. These conditions may make Titan the most hospitable extraterrestrial world within our solar system for human colonization. It also may have extraterrestrial life. Titan is the second moon which humanity ever landed a spacecraft, after the Earth’s own Moon (see the video below). On January 14, 2005, ESA’s Huygens probe made its descent to the surface of Saturn’s hazy moon, Titan. Carried to Saturn by NASA’s Cassini spacecraft, Huygens made the most distant landing ever on another world, and the only landing on a body in the outer solar system. This video uses actual images taken by the probe during its two-and-a-half hour fall under its parachutes. Huygens was a signature achievement of the international Cassini-Huygens mission, which will conclude on Sept. 15, 2017, when Cassini plunges into Saturn’s atmosphere. The largest moon of Jupiter and also the largest non-planet in our Solar System. It is 8% larger than the planet Mercury, although only 45% as massive. It is the ninth largest object in the Solar System, and the largest without a substantial atmosphere. Ganymede is the only moon with its own magnetic field, which causes auroras. Scientists have also found strong evidence of an underground ocean on Ganymede. Ganymede was discovered by Galileo Galilei on Jan. 7, 1610. The discovery, along with three other Jovian moons, was the first time a moon was discovered orbiting a planet other than Earth. The discovery of the four Galilean satellites eventually led to the understanding that planets in our solar system orbit the sun, instead of our solar system revolving around Earth. The German astronomer Simon Marius (1573-1625) probably made an independent discovery of the moons at about the same time that Galileo did, and he may have unwittingly sighted them up to a month earlier, but the priority must go to Galileo because he published his discovery first. The Galilean moons are the four largest moons of Jupiter: Io, Europa, Ganymede, and Callisto. They were first seen by Galileo Galilei in January 1610 and recognized by him as satellites of Jupiter in March 1610, hence the term.